Earn $59.99 in Rewards credit (5999 points) What's This? Start your ride on the right pedal. 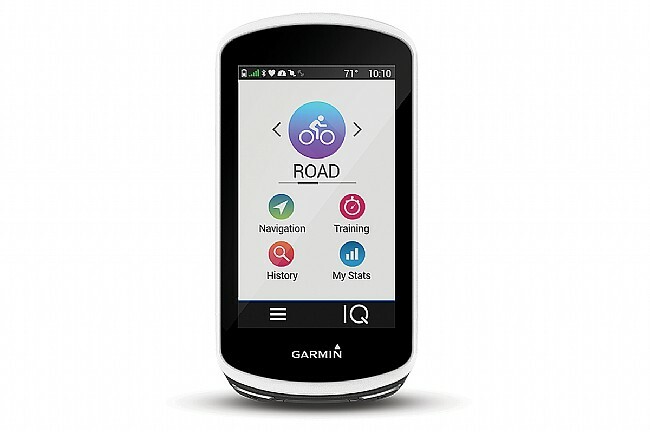 The new, ride-enhancing features of Garmin’s Edge 1030 cycling computer, combined with the tried-and-true sophisticated features of its predecessors, ensure you start your ride on the right pedal. 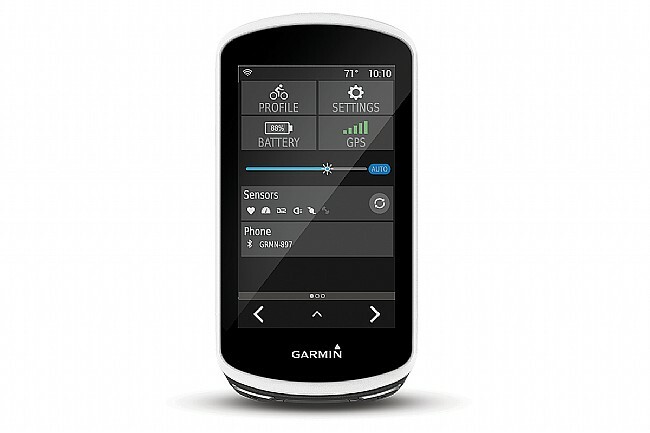 The Edge 1030 is equipped with all of the sophisticated features we have come to expect from Garmin’s cycling computers such as touchscreen operation, smart connectivity (including notifications) with compatible smartphones, cycling and power dynamics (with compatible power meters), VO2 testing and stress scoring, GPS/GLONASS and an altimeter for reliable navigation and tracking, and Connect IQ™ compatibility, to name just a few. In addition to these “staple” features, the Edge 1030 introduces the following selection of new, ride-enhancing features: rider-to-rider messaging, Trendline™ routes locater, a larger display, a longer lasting battery, and an In-line Flush Mount. Rider-to-rider messaging offers a safer alternative to texting while riding. Instead of unsteadily searching for your phone and taking your attention away from your surroundings to send a text, you can send a pre-set message through your Edge 1030 device to other Edge devices, like if you get dropped but don’t want your ride buddies to wait - this new feature has your back. Trendline™ is another handy, new feature of the Edge 1030. 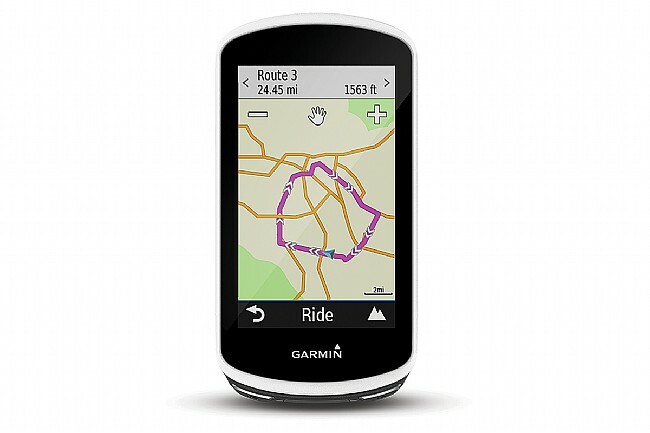 Trendline™ uses data from Garmin Connect to locate the most popular routes nearby - both on- and off-road routes. This means you don’t have to waste anymore time searching the web for cool routes in areas that are new to you. In addition to a larger, 3.5-inch display and a battery that lasts up to 20 hours (or 40+ hours with the extended battery pack), the Edge 1030 is introducing a new mount design - an In-line Flush Mount - that aligns your device with your handlebars for a smoother cockpit aesthetic. Normally I wait a while after adopting a new bike computer but I really wanted the bigger screen and longer battery live because I do ultra distance rides and want navigation visible at a glance and no need to add a battery so I took the plunge and haven't had any issues. Its running software version 3.70. Haven't had any glitches with anything - it will run my virb camera, varia lights, my Elite Drivo trainer, all with zero problems, and the touch screen works perfectly even in the rain. It's big so the Garmin mount is really needed for it to fit on a bike and get to the buttons easily. The K-edge XL does also but puts it very close to the bars, so close it makes the lap and stop bottons a little hard to access, not impossible. The screen colors are a bit dull, but it's very readable. Garmin really did a good job with this one, it's a home run in my book. I also have 510 and 820, and had a 500 before that - this one is a very nice improvement over all of those. Pricey but it's worth it to me. 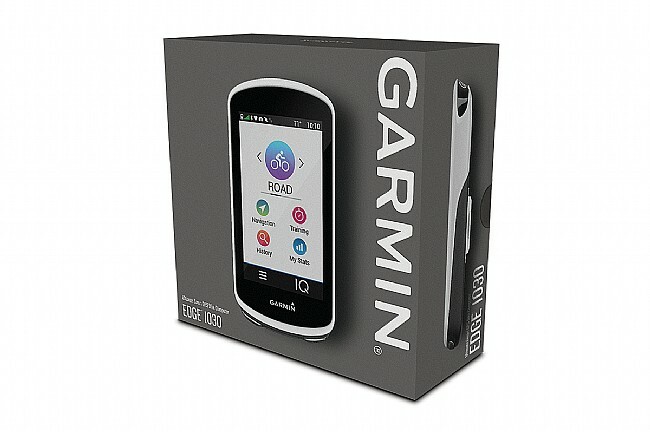 I have had a Garmin Edge 520 for three years. I liked it a lot and still use it on my gravel bike. However, on longer rides, particularly when I used navigation it was always a race to see which would end first, the battery in the 520 or the ride. That is no longer a problem. I redid a ride last weekend that had left my 520 gasping by the end with barely anything left as I rode into my driveway. The 1030 had more than 70% of the battery left at the end of this. Beyond the battery, though, the screen is wonderful. All of the data fields are easily read. When text messages come in I can actually read them on the screen. Like my 520, it paired with my various ANT devices and my ETap gear combo. I had some minor issues getting to to talk to my iMac, but that was resolved with a direct connection to the computer, rather than through a hub. I can say, sincerely, that I have not had a moment of regret. It really is a superb computer. The navigation screen is really nice, a big improvement, both literally and figuratively over the 520's. Having the option to add a extended battery, though it doesn't seem that I will ever need one, is a nice touch as well. Edge 1030 has a great display, easy to use and setup. I grew tired and frustrated with my Edge 1000. Had two device replacements to fix connectivity issues, and problems with the device restarting unexpectedly, and corrupting routes persisted through device restores. Why did I buy an Edge 1030? Holding out for the promise of GroupTrack with a couple friends, and family. Is it worth and upgrade? The 1030 was a great purchase and exceeded my expectations. Ill explain why it was to me. Yes, the 1030 seems to have had issues with connectivity at launch. That seems to have been resolved given the drop in complaints in online forums. The walk through did not work for me, but did get it setup manually on the first attempt, and has worked well since. I get 2-3 times the battery life out of the 1030. Id always worry doing a longer ride with the 1000, and took a 705 as a backup. The 1030 should be fine for most riders, including centuries. Could not do that with a 1000. And if you need more, they have a battery for that! What other reviewers have not mentioned . The personal fitness screen. What is that? It is a useful summary of personal fitness, FTP, VO2 Max, and stress. Seems to reflect my fitness well, and reminds me to take it easy the next time. Ive found this information helpful and well presented. Reorganizing data fields is easier. You can select several data fields from one category, and selected fields show up on the category when selecting again. Best of all, you can can drag data fields to reorient on the screen. The device also has templates to allow larger fields to be placed in the middle or bottom of the screen. Not completely customizable, but better. The graphical representations of heart-rate, cadence, power, and elevation are very good. You can choose to view max, average, and current values, in to small data fields, along with a bar graph. Map navigation and recalculations are much faster. Actually able to use them in real-world situations. Routing along heat map routes does work. Im in a challenging geographical area, and it seems to find the best options. Does not route along paved trails as much as expected, though. The 1030 has a sensor refresh button. I typically forget to turn on the radar, flip my hear rate strap, or the power meter may time out. The refresh button is easy to get to, and does it for all sensors. No need to navigate into each sensor and fiddle with it to get it activated again. Finally, the Strava live segments are something I want to use! Strava live segments on the 1000 seemed to crash my device. It was slow to refresh, and did not have much information. The new segment screen pops up as before, but automatically selects the most interesting information. KOM? Im not that fast, but it does bring up my PR, as well as my friends above and below me, that I know I can beat. Am I slowing down or speeding up relative to prior efforts? It changes the selection of friends to accommodate! The display shows the total distance on a bar graph, and the relative distance ahead of your friends. It seems hard to just go for a ride trying to navigate multiple screens. I do appreciate the incident report aspect and the bright screen yet I would like the ability to password protect the device and make voice commands. Ordered this to work with a newly purchased power meter. The computer works great and tracks accurately. With Broadcast Mode it syncs with the heart rate monitor from my Garmin Forerunner watch. I love the navigation software, plus you can create your own routes with Strava if you are looking to explore a specific path. It recalculates any time you go off course to put you back on. If you connect it to your phone you can also use a live track feature and will notify emergency contacts if it detects a collision. Luckily haven't had to try the collision part, but the live tracking works great. It's a bit pricey, but you get a lot for it. I love the user interface and the available metrics. I have had none of the issues that have been talked about. The only issue I have is a the accuracy of the GPS, I have to use a speed sensor otherwise my speed is all over the place. Easy to setup and use. Integrates easily with Varia radar rear light. Beeps and shows red lines on the sides of the screen when a car is 400 yards behind you. Love it! Seems to be made well, obviously better than the Edge 1000. The charging port appears to be sturdier and in a much better location. It should be able to be charged with a remote battery charger while riding (the Edge 1000 could not). The main improvement for me is the increased battery time. Before I got mine, my buddy had one during a 300k ride that lasted from 0630 until 2300. He said he had 30% left on his battery. This was also the last day my Edge 1000 worked. While charging it during our lunch break, and again later in the ride, the charging port broke became loose, and never worked again. My Edge 1000 lasted 1 12 years, not good! Have used 520 and 820. 520 was favorite until this new model. Syncs great with iPhone, Strava. Easier to see. Looking forward to using mapping features this summer. It would be hard for me to say it is a good piece, it is fantastic. Upgraded from an Edge 500. Start up and satellite acquisition is MUCH faster. Like my smartphone, this device can do more than I can ask it to do. I like the different profiles. I can have different screens for a road ride or a gravel ride or my commute. It's an investment for sure, but if you want the top of the line, you need to pay for it. Enjoying my new bike computer. Fairly easy to learn and use. Im not one for reading directions. 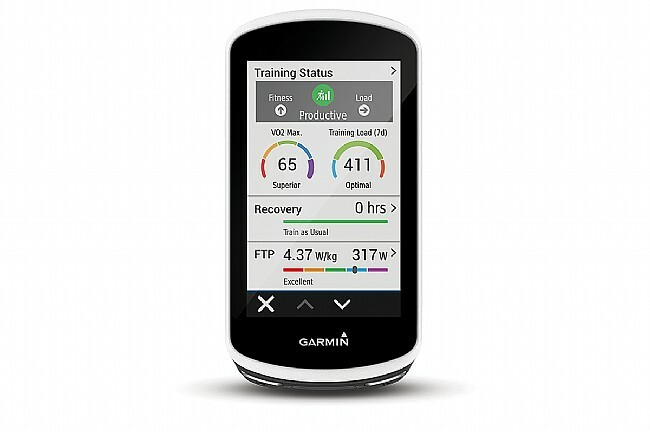 Garmin continues to improve the cycle computer, and totally dominates the market for highly functional devices. 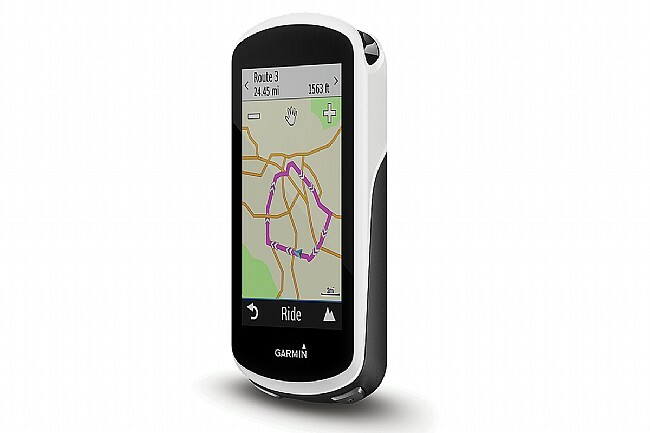 The Garmin 1030 is a nice improvement over the 1000, although the 1000 was quite good. The 1030 screen is easier to read, which is a big deal for me since my eyes aren't as good as they used to be. I have to wear magnifiers to read a tablet or phone, but I can read the 1030 screen ok without glasses, even with 8 different parameters displayed on the screen. I like the new routing algorithm which uses Strava heat maps to pick the best route. I've definitely noticed that it picks better roads. I am now using this computer with the Garmin Vector 3 pedals on one of my bikes, and there is a lot more information available. While I don't follow a rigorous training program, the added information is helpful and inspires me to push myself a little harder. The battery life seems somewhat better than the 1000. I've done a couple century rides since getting it and there was still plenty of juice left over when I was done even though I'm not as fast as I used to be. I am an endurance rider-10-14 hours. Longer battery life ensures I can track my entire ride. The larger display with my aging eyes is appreciated. Tracking unfamiliar routes is a great feature.